Traffic fatalities in NYC declined 11 percent through the end of May compared to the same period last year, according to NYPD crash data. Up-to-date crash data hasn’t been available through City Hall’s Vision Zero View website since the end of February, with the city saying it will post fresh data after a new reporting system is implemented. NYPD has, however, resumed publishing crash information on the city’s open data portal, which is publicly available but lacks the same accessibility and ease of use. Jon Orcutt, former policy director at NYC DOT and current advocacy and communications director at TransitCenter, posted an update on fatalities at his personal Tumblr using the NYPD feed. 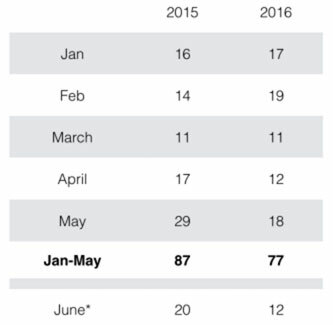 As of the end of May, 77 people were killed in traffic in 2016 — down from 87 at the same point last year. All of the improvement happened in a single month — May — a caveat to avoid reading too much into the numbers. One cause for concern is that total traffic injuries are up, from 18,914 in the first five months of 2015 to 22,226 through May this year. Looking only at pedestrian injuries, the number is also on the rise — from 3,949 to 4,395. The injury statistics don’t account for severity, however, so we don’t know if serious injuries have increased, bucking the trend in fatalities, or if minor injuries are propelling the increase. Under the de Blasio administration’s Vision Zero initiative, NYC has continued to redesign streets, and it has increased enforcement of “failure to yield” violations and speeding. Notably, the city finished installing the 140 speed enforcement cameras allowed by Albany last September, so there were more speed cams at work in the first eight months of 2016 than the same time in 2015. While 2016 will be the safest year on record in NYC if the decrease in traffic deaths holds up over the full year, the city will still not be on pace to achieve the Vision Zero goal of eliminating traffic deaths by 2024. With legislative leaders and Governor Cuomo failing to pass a bill expanding New York City’s automated speed enforcement program this session, it’s even more urgent for City Hall to make changes to the streets that will reduce the loss of life. I donated to Streetsblog years ago, but stopped over the recent years. This isn’t exclusive to Streetsblog, and applies to many other advocacy groups that in my view, are never satisfied with what is extreme progress, and won’t be satisfied unless an unreachable goal is hit. Plazas have been put up all over, including in areas where Community Boards have voted against it. Speed limits have been reduced, including in areas where the majority drive, and didn’t want the decrease. I approve of all of this, but this should be the headline, not that there is outrage due to an increase in speed cameras of only 400% in the last couple of years, and that we don’t have a speed camera on every block. Cameras are being increased every couple of years, and this is great news, and what should be focused on. Just because every block doesn’t have one, isn’t a reason to attack legislators- progress is moving in that direction, but obtaining it right now was never realistic, and isn’t something to be outraged about. This article was the kicker in my head. From the safest year in history, we are now down another 11% of traffic deaths. Amazing! A tribute to all this administration has done, right? Wrong- the author is still angry, since a bar that was never realistic, won’t be hit. As a Civil Engineer, I can tell you that while zero deaths is a great goal, it will never be hit. Deal with it. David Meyer (the author) will be disappointed every year, even as fatalities continue to drop, with more amazing progress being implemented by our elected officials, which I am thankful for, but is so rarely the focus of an article here. I find that to be very sad. Be helpful to have a ten year trend line. Year to year is too variable. If memory serves, 2015 was already a very low year for fatalities, so 2016 is probably historically low. Also, useful would be fatalities and injuries per 100k people. NYC pop has been growing, and this would really emphasize incredible progress. Is a bit baffling that City Hall isn’t bragging about this — they should be. Also, surprising that VZ website is not updating since VZ is key de Blasio priority. Take some credit for saving lives would you? … the hedline of the post is that traffic deaths are down. If it wasn’t for Streetsblog continuing the push and putting the constant pressure on, we’d never get to even close to Vision Zero. So stop donating. Progress will halt if everyone did the same. Point noted. Thanks. I find this reduction, from a previous historic low, to be nothing short of amazing. Even if Mr. Meyer believes it won’t get us to where we want to be, I’ll take the glass half-full side any day of the week: a constant double digit reduction in deaths, year over year. That would be a dream come true in 2024- a 57% reduction in deaths from where we are now (.9 ^ 8 = .43). Even if some people aren’t happy that it isn’t zero. 2015 may have been low in New York, but compare it against national statistics, which have been seeing higher numbers of crashes, injuries, and deaths, and you realize that NYC is probably doing something right. The reason for aiming for zero is very simple. If you aim for the stars you might end up on Mars or Jupiter. If you aim for low Earth orbit you’ll probably end up in the toilet. Our times are sadly marked by a large segment of the population aiming for at best mediocre goals, and often not even hitting those. It’s time we aimed higher, not just against traffic violence but in many other facets of life. I also personally think near zero is achievable but it’ll take more than slogans, speed cameras, or even more aggressive prosecuting of reckless driving. If we can succeed in getting rid of all but essential vehicles in NYC we might have a shot at getting close to zero. Private automobiles largely operated by amateurs especially have to go. The goal of zero deaths by 2024 was announced by they Mayor himself, not by StreetsBlog. Should advocates expect LESS than what officials promise!? Yes. If an official promises you something that you know is not possible, advocates should expect less that what this official promises. It is not possible to have zero deaths in a given year- and most reasonable readers would agree. Advocates always demand more from what officials promise, not less. If not, then what’s the point of advocacy altogether? Just accept what the officials give, right? Who says it’s not possible to have zero deaths? Do you have some data to back that up? In the U.K. they cut traffic deaths by 46% over the past several years. There’s no reason this country can’t do the same. In 2015, the US had a SPIKE in traffic deaths! But in NYC traffic deaths have dropped. Without advocates we’d probably have the same spike as the rest of the country.